Comfort Keepers provides in-home care that makes a difference in the lives of seniors, other adults, children and families. Whether is be providing companionship or personal care in the home, a care plan is developed with each client to meet their individual needs. Comfort Keepers personal care services could include: Bathing, grooming, mobility assistance, transferring and positioning, toileting, dementia care, medication reminders. 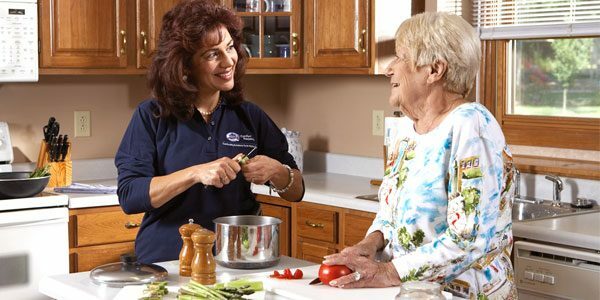 Our other care services could include: companionship, meal preparation, laundry, light housekeeping, transportation, grocery shopping, respite care for families, post operative 24 hour care. Interactive Caregiving is the unique way our Comfort Keepers deliver care to our clients. Study after study show that active and mentally stimulated seniors enjoy a better quality of life and physical well being. Our interactive caregiving centers on four interrelated aspects: engagement of the mind, an active body, proper nutrition and safety. Care and support is offered in Orangeville and throughout Dufferin County, the hope is to improve quality of life and help maintain independence living at home. Care can be set up in as little as 24 hours depending on needs and staff availability. Comfort Keepers caregivers are selected after a full interview process, including background checks, personal and professional references. Our staff are employees and not contractors, bonded, insured and covered by Worker’s compensation. They are trained specially to provide interactive care solutions for clients.